Upgrade your Hoover Dam experience with a 20 minute float trip on the Colorado River for an up-close view of the Dam. You’re expert guide will take you on an adventure in a Tour Trekker and provide historical facts and information as you are awed by the amazing views above and below. This is absolutely the best photo opportunity of the Hoover Dam and Colorado River - a true postcard. After a comfortable ride in a Tour Trekker, you will start at the top of the dam and work your way down below, learning about the history and daily operations. This custom built tour vehicle is equipped with plush leather captain’s chairs, extra-large viewing windows, and a flat screen DVD player for the ultimate in touring style. Your Hoover Dam tour experience will take you on an adventure with a 20 minute float trip on the Colorado River for an up-close view of Hoover Dam. 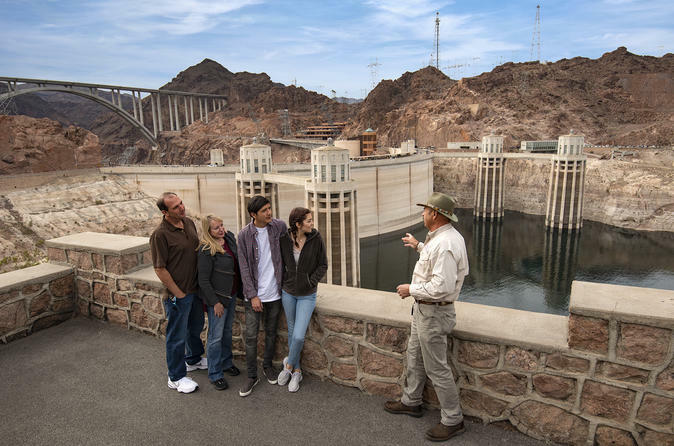 Your expert guide will provide historical facts and interesting information as you are awed by the amazing view of the Hoover Dam bypass, a nearly 2,000-foot-long bridge spanning over 900 feet above the river.